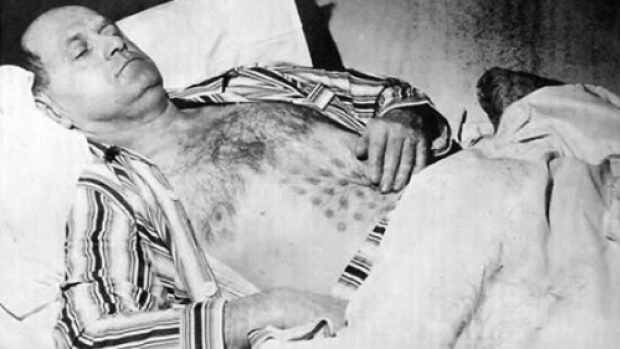 It was something that put his family life into upheaval and remains one of the world’s best-known UFO encounters. “I recalled seeing him in bed. He didn’t look good at all. He looked pale, haggard,” said Michalak, who was nine years old at the time and was allowed to see his dad for a couple of minutes on the day after what soon become known as the Falcon Lake incident. “When I walked into the bedroom there was a huge stink in the room, like a real horrible aroma of sulphur and burnt motor. It was all around and it was coming out of his pores. It was bad,” said Michalak, who co-authored the book When They Appeared with Winnipeg UFO researcher Chris Rutkowski. Stefan Michalak’s sketch of the strange craft he encountered. The book will be launched on Saturday in conjunction with the 50th anniversary of the incident. “I was very afraid. My dad had been injured and I didn’t know anything about it,” Michalak told CBC News in recalling that Saturday 50 years earlier. The story about his dad being burned by a UFO ran in the Winnipeg Tribune newspaper “and that’s when everything pretty much hit the fan,” Michalak said. Stefan Michalak was an industrial mechanic by trade and an amateur geologist who liked to venture into the wilderness around Falcon Lake — about 150 kilometres east of Winnipeg — to prospect for quartz and silver. He had staked some claims the prior year and set out on the May long weekend in 1967 to explore some more. According to his accounts, as reported in newspapers at the time and since repeated in books, magazines and on TV shows like Unsolved Mysteries, Stefan looked up and saw two cigar-shaped objects with a reddish glow hovering about 45 metres away. Believing it to be a secret U.S.military experimental craft, Stefan sat back and sketched it over the next half hour. Then he decided to approach, later recalling the warm air and smell of sulphur as he got closer, as well as a whirring sound of motors and a hissing of air. He said he called out, offering mechanical help to the “Yankee boys” if they needed it. The voices went quiet but did not answer, so Stefan tried in his native Polish, then in Russian and finally in German. Only the whirr and hiss of the craft responded. Inside, Stefan said he saw light beams and panels of various-coloured flashing lights, but could not see anyone or any living thing. When he stepped away, three panels slid across the door opening and sealed it. Disoriented and nauseous, Stefan stumbled through the forest and vomited. He eventually made his way back to his motel room in Falcon Lake then caught a bus back to Winnipeg. That’s who Michalak refers to in the title of the book — those endless visitors and phone calls, the media and people camping on the lawn, the people who would follow Michalak to school one day peppering him with questions. But at the time, he felt it was a duty. He wanted others, if they were to see the same thing, to avoid it and not get hurt, Michalak said. In addition to constant probing from authorities, the family endured condemnation and criticism in the public, Stefan’s sanity was questioned and Michalak was bullied in school. “If you asked him what it was he saw, he could describe it in intimate detail but he would never say, ‘Oh, it was definitely extraterrestrials,’ because there was no evidence to prove that,” said Michalak. In all those years since and with some 300 pages of documentation on the encounter, “there’s nothing so far that has flawed his story,” Michalak said. “I’m not so close-minded that I can’t entertain the possibility that it’s otherworldly. I can’t discount that. But without specific evidence to show me that it is, I don’t know,” Michalak said. The case was investigated intensely by a number of levels of government and the official conclusion, even from the United States Air Force, was that the case was unexplained, Rutkowski noted. “The Falcon Lake incident is possibly Canada’s best-documented UFO case,” he said. Doctors did a thorough investigation and even sent him to a psychiatrist “who came back with the report that this is a fellow who’s very pragmatic, very down to earth — pardon the pun — and does not make up stories,” Rutkowski said. “If Dad hoaxed this — remember we’re talking about a blue-collar, industrial mechanic — if he hoaxed it then he was a freakin’ genius,” said Michalak.